Mao is still revered in China as a god or demi-god. 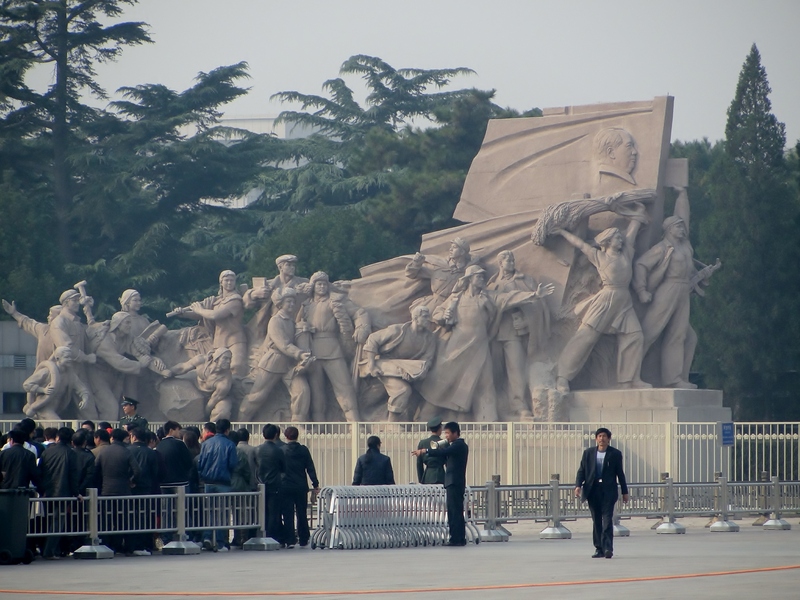 The life-dream of many Chinese is to visit the mausoleum in Tiananmen Square where Mao is encased in crystal, his body covered by the Chinese flag. For those in the most remote and poorest areas of China, this trip to Beijing is the culmination of a good life, at least for a man—that he can afford to travel to the capital and pay respects at Mao’s grave. For Xi, the memory that makes her smile the most is remembering the tears in her grandfather’s eyes as he realized that she was telling him that with her first year’s earnings as a tour guide she was taking the three of them—Xi, her mother, and her mother’s father—to Beijing to visit Mao’s tomb on his 75th Spring Festival. 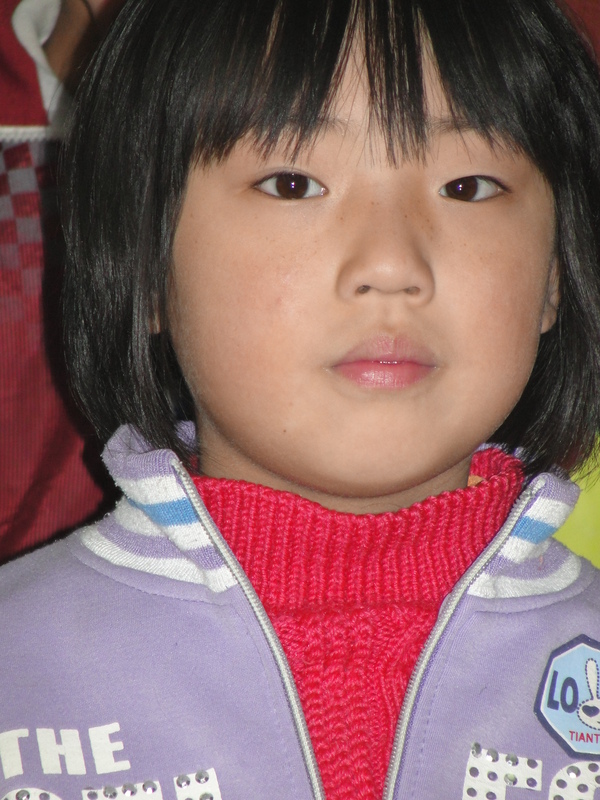 They would travel by bus and stay in a hotel room in Beijing—her grandfather’s first. They would walk to the tomb the following morning, and then return by night bus. Chengdu to Beijing is a trip of almost 1200 miles. He had been ill and would not live long. On that trip he had cried more tears than Xi had thought humanly possible. When they finally reached the entrance to the tomb, he was supported by his grand-daughter and his daughter and either side and Xi could see his tears were tears of joy. The lines outside Mao’s tomb even in the rainy season are often a mile long. Today in a steady mist mixed with the grey afternoon smog, the line shuffles forward half-a-step at a time. It takes well over an hour to enter the mausoleum. It is obvious that many have walked hundreds of miles, their sleeping rolls and cooking gear on their backs. No one is talking. Most of them carry gifts they’ve brought to leave at the tomb: something they have grown in their garden on their own land, a garden they can pass on to their children because of Mao. A photograph of themselves or their family with a member in the blue uniform of the People’s Army. Handwritten letters; an armful of flowers; packages wrapped in clear plastic and ribboned in red. Everyone—young and old—is taking photos of the line and the grey-white marble tomb and each other with their Smartphones. Many are reading worn copies of The Little Red Book, a collection of aphorisms from Mao’s political speeches and philosophical writings. 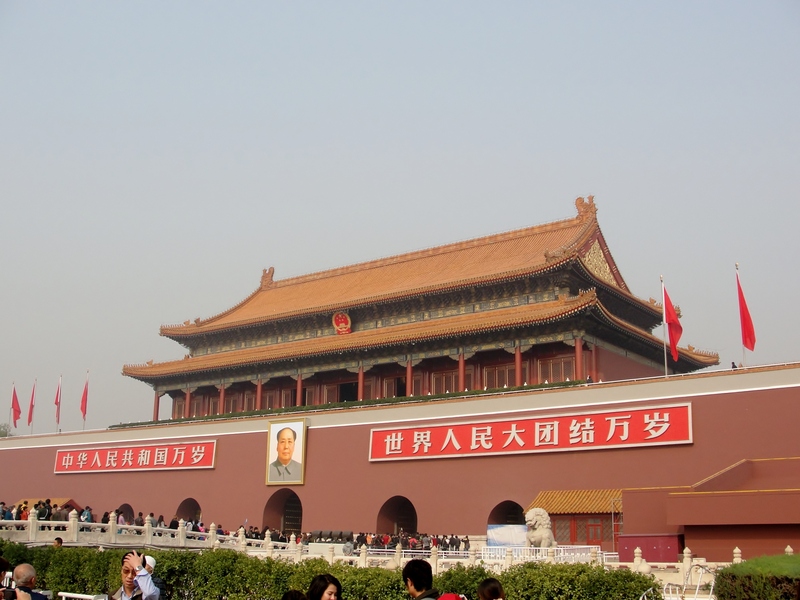 Tiananmen Square is the largest public gathering place in history. It is here, our local guide tells us—Shu is a short college-age woman with a sharp voice in smart western dress, fluent in Chinglish, she calls it, talkative and witty—that the Chinese government did a very bad thing. It is against the law for the government to turn the guns of its soldiers and tanks on the people it is entrusted to protect. Those who were responsible have been demoted and punished, and as proof Shu points to the fact that there have been no troubles since. She points to the lack of armed soldiers in the Square except for the lazy ones lounging in the shade, leaning against the walls of the mausoleum. But what’s plaguing China today is not government repression but corruption. She says that after Mao the joke is that modern Communist Party members want socialism for the people, but they want to live in 5-star hotels. The biggest challenge for China today, she tells us, is that there are 56 nationalities in China, which means that there are 55 minority races, in addition to the Han majority. One of those minorities is the Christians who despite what is taught in the west are allowed in China. 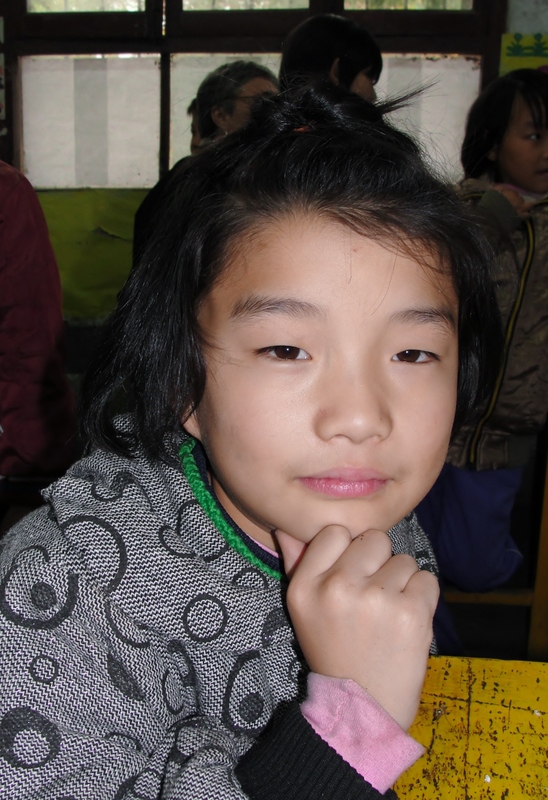 The latest census says that there are over 100,000 Christians in Beijing alone. The Chinese celebrate Christmas, even at work, where everyone has a Secret Santa. You choose a name out of a hat and then go out and buy a gift that you believe will have some meaning for them. You might learn that your co-worker collects butterflies, or belongs to a tango club, or has recently lost a family member to cancer. You would buy a gift that you believe reveals their value as a human being, someone bigger than their career, to remind everyone in the office that they are people first and employees second. But the big festivals for the Chinese will always be the Spring Festival—the lunar New Year—and Independence Day, October 1st, the anniversary of the establishment of the People’s Republic of China in 1949. These two very distinct celebrations highlight one of the ways in which China is both one of the oldest and one of the newest countries. For the Spring Festival, it is important to celebrate with your family, and for a week on either side of the full moon the entire country is in a rush to get home, their arms filled with presents, too many people for too few seats on all means of transportation. On Independence Day most people stay home, as it is meant to be spent as part of your community. Beijing is growing so rapidly that they are currently building their ninth ring road, and will begin building the next ring road before this one is fully operational. The current plans are for a new ring road every five years. And as the ring road system expands, the city limits expand with it, and the subway follows. Although the city blocks are filled with high-rise apartment buildings, there is a remarkable amount of space and sky for a city the size and age and importance of Beijing. Even in the center of the city there are broad sidewalks and green spaces surrounding most buildings, and there is a park or baseketball court or soccer field on almost every city block. These also serve as gathering places for the locals in the evenings, especially in the summer months. The government is encouraging people to buy cars, but discouraging them from driving them. A number is chosen each weekday morning in a lottery, and if that number is the last number on your license plate, then you have to leave your car at home. That means that working people—virtually the entire population other than children and the aged—have to be prepared every morning to carpool or use public transportation at the last moment. Gas is the equivalent of $4.50 a gallon in Beijing, but $4.50 is a lot of money to the Chinese. The latest statistics from 2011 report that Beijing has twenty subway lines used by seven million people every day, and another four million a day use its 150,000 buses. The government makes it an easy and cheap alternative to driving and it seems to be working. Most families have one car, but most of their transportation is on foot, bike, scooter, motorcycle, or public transportation. The streets of Beijing are packed with cars and motorcycles, but not remarkably so. Most of the transportation on the city streets are buses, and each one is filled and overflowing with bored, passive-looking grey or pale faces. Cellphones are ubiquitous, and many appear to be playing on-line games. On the weekends, every car can drive, and they do. There are currently five million cars in China, most of them in the cities. There are twenty million people living in high-rise apartment buildings in Beijing. 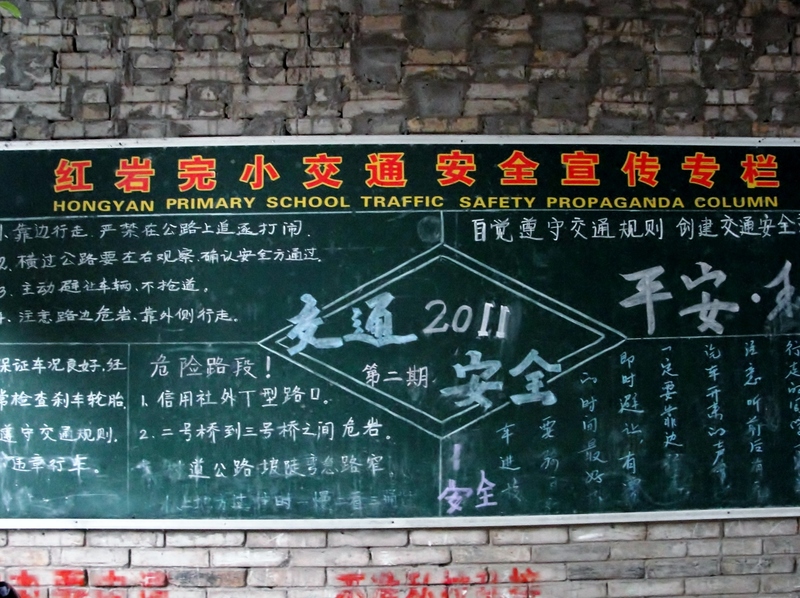 Education is seen as the future for China. The peasant population is still largely uneducated and there are plans to bring more children to the city, where it will be easier to educate them. 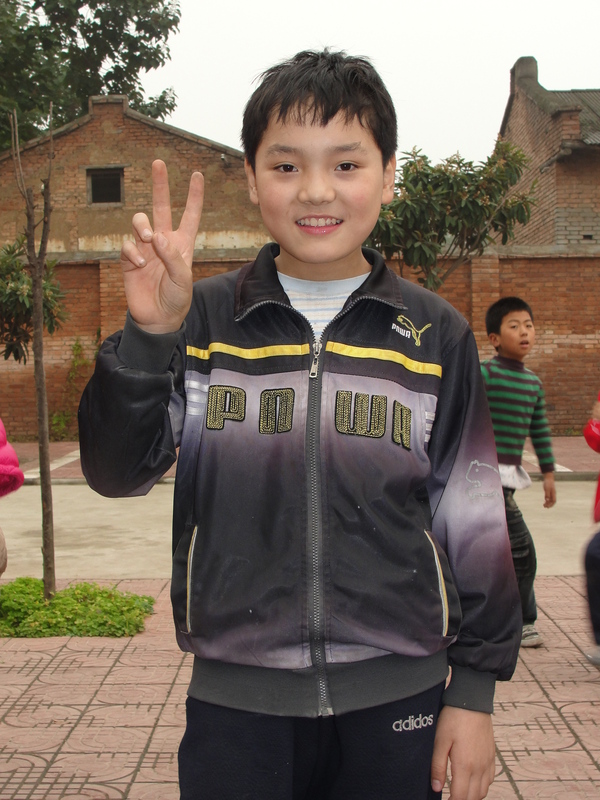 Currently, there are six primary grades and three middle school grades that are paid for by the government, but high school is the financial responsibility of the parents, and most rural children return home to help in the fields at the end of the ninth grade. 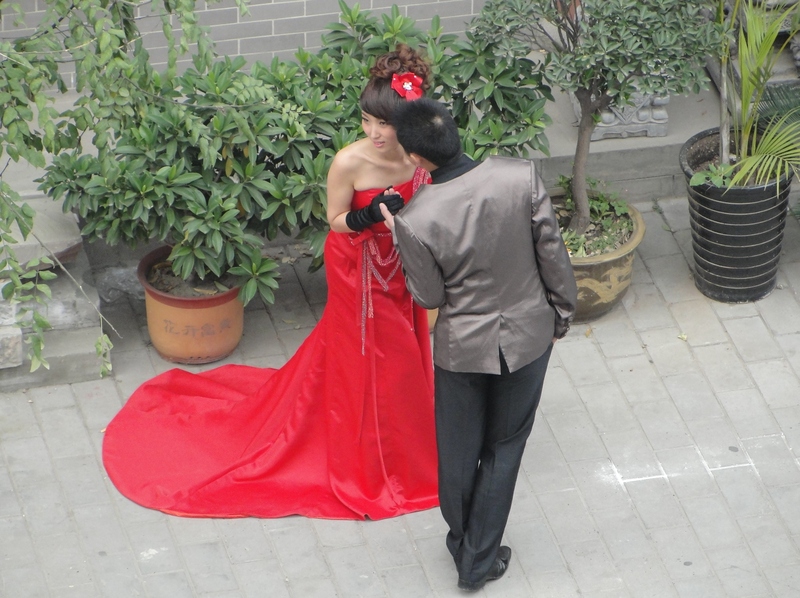 Eighty-five percent of the marriages in China are arranged by the couple themselves, and the rest are arranged by the parents without any participation by the children, often when the children are still quite young. These arranged marriages are common only in the most remote provinces, especially in nomadic tribes and minority cultures. When a Chinese couple is interested in marriage, the man asks the woman’s parents for their permission. If permission is given, the next stop is the fortune teller, who is more of a Chinese astrologer. First the fortune teller reads the zodiacal signs for the couple. If they’re compatible, then he determines the most auspicious dates for their wedding. Occasionally the fortune teller will caution against a marriage, but this is extremely rare. If the couple is warned that the stars are in opposition, they can always go to a second fortune teller, which usually results in a finding that the stars are within acceptable levels of risk. But at every step the couple is free to do what they like. Some of the most modern Chinese are not going to a fortune teller at all, although for most of the country this seems like incredible folly. 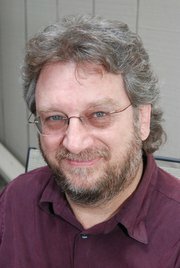 If either of the parents object to the marriage—which is rare—the couple will most likely elope. Later, when the first grandchild appears, the families will usually reconcile. China still has a one-birth policy—not a one-child policy, Shu reminds us, because of course women sometimes have multiple births from one pregnancy and no one will be charged for that. If you want to have more than one birth, you have to pay a fee to register the second child with the government. The tax is intended to cover all of the additional costs of a child to the government—including schooling and medical care and social benefits. But anything is possible in China, she says, if you have the money. There is a saying in China that if you want the honey you have to bring the money. 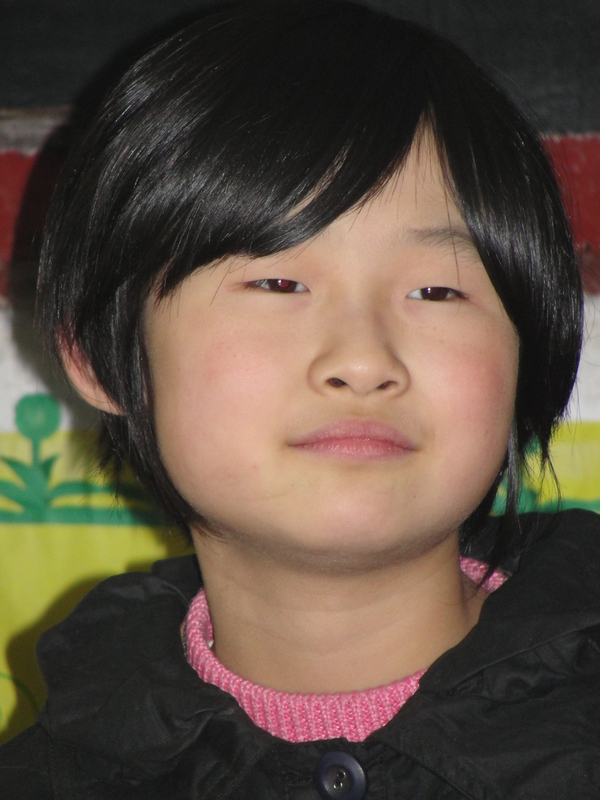 These days it is a status symbol in Beijing to have three, four, even five children. Xi is our 26-year-old Buddhist traditional landscape painter tour guide from Chengdu, Sichuan Province. 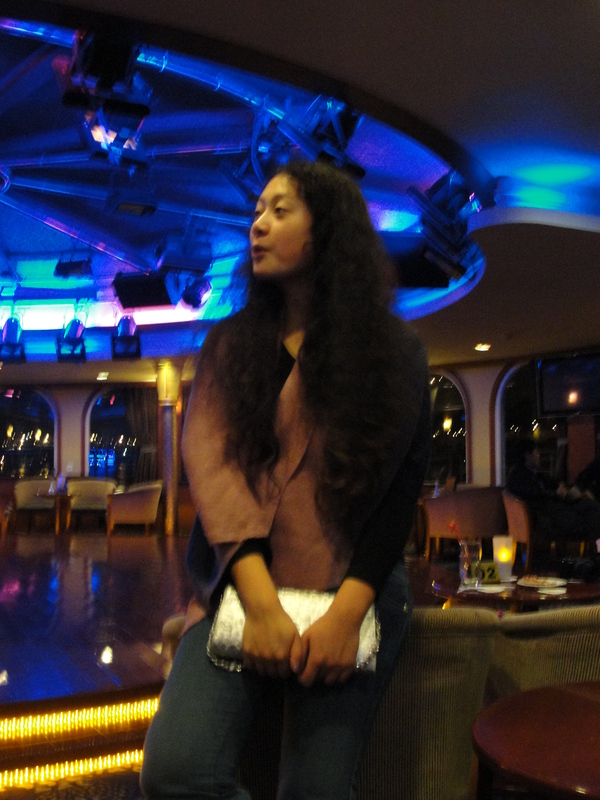 She describes herself as “fat” (she’s not—the Chinese in general are skinny and she is not) and seeking a husband. 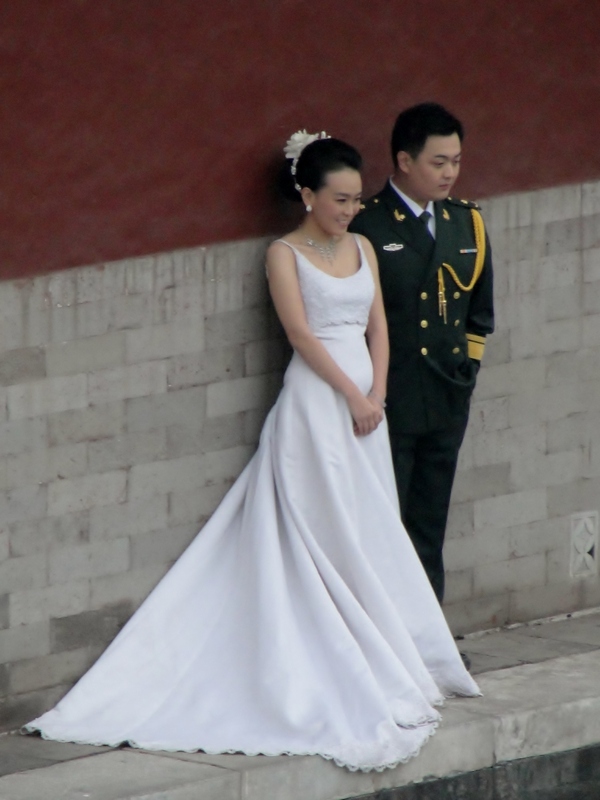 It is unusual for a Chinese girl to remain unmarried until her 26th year. She has tried hiring a matchmaker and has advertised in the “seeking marriage” columns in the major newspapers, but things have never worked out for one reason or another. One potential suitor insulted her by talking of their impending marriage as if it was strictly a financial transaction. Finances are important, she agrees, but not to the exclusion of everything else. One was too immature for her. One she did not like the way he smelled. That sounds bad but you would feel the same way, she tells me, if you smelled him. One wanted them to live in his remote village, and she is a city girl. She sounds like she is speaking from experience when she says she is suspicious of marrying for love. Love is short, she sighs. Life is long. Shu is sitting in the back when Xi bends down to give directions to the driver. She tells us that Xi’s curly hair probably means she has mixed blood, but Xi insists she is full-blooded Han. She can’t explain the curly hair other than that she inherited it from her father. Xi is looking for a man four years older than she is, which she believes is the most advantageous age difference for a man and a woman. But she believes that as a woman she has no control over her attractions, and she is currently having difficulty extricating herself from a relationship that she’s ashamed of. She believes that passion cannot be overruled without damage to them both. She believes that the loves in a woman’s life are fixed before she is born and she must follow what is laid out before her. Fate determines our choices, she says, but our choices determine our fate. She says that the woman always chooses the man but the smartest women are careful to make him think that he is choosing her. This is a skill she was taught by her mother, and her mother was taught this as well by her own mother. It is something that has been passed orally from Chinese mother to daughter from time out of mind. I ask Xi if the father likewise schools the son but she doesn’t think so. Boys don’t know anything, she says. She feels sorry for them, she says. They never know what bit them. Xi has been in love several times and is no longer interested in boys her own age because they know nothing of importance, own nothing, lack insight, and their expectations are unreasonable. Men need to be trained like a puppy, she tells me, and it is best if you find someone who has already been broken-in, because loving someone you do not have to train is hard enough. She wants a husband like her father—a “soft-ear” husband—someone who can listen to his wife. And it must be a marriage of equals. To be outranked by the man is almost as bad as when the wife outranks the husband. Some women let reason and logic determine their love choices, but they have chosen safety over love. To play love safe, she tells me, is not to love at all. A secure and loveless life is an unhappy life for the woman, and the husbands of an unhappy woman are the unhappiest men of all. Other people are happy when someone else bets everything on love and loses, but few people notice there are penalties for playing it safe as well. And no one mentions that there are those who really do find happiness that fills all of their days till the end. And who’s to say which of those choices—no matter how they end—was the right one? It’s best to be rebellious she says. It’s best not to be your own jailer. But you keep in mind that everyone you meet will die and there will be many unhappy days before the end, for both of you.